Join us on Saturday, February 16, from 12-2 p.m. for the community unveiling and walking tour of On Whose Shoulders. On Whose Shoulders is a series of posters made by Oakland based artist, Lukaza Branfman-Verissimo, in collaboration with local community members, Marilyn Michaels, Anne Marie Eunice, David Brooks, Samantha Kuykendall, Leroy Staples, Dr Dreame and Jasmine Jubulee Gee. Come welcome this work to the City of San Francisco, in a half mile walking tour down Market Street, featuring performances, spoken word and storytelling by the participating collaborators. We will be traveling as a group and lunch will be provided. On Whose Shoulders is a part of the San Francisco Arts Commission’s Art on Market Street Kiosk Poster Series for 2019. The posters will be on view for two months. Thinking about the many communities that occupy the Market Street Corridor, I am specifically drawn to the stories of those who are being marginalized from, and pushed out of, the neighborhoods that run along Market Street. Stories of house-less folks, of the LGBTQIA+ community, of artists of color and community activists, of the people whose roots the city of San Francisco was built on. These nine posters are a way for the community to interact with, and remember, the history upon which they are living in, and for visitors to better understand the many layers of the past, present and future that the Market Street Corridor holds. These stories shine in bright colors and make space for these histories to be known. 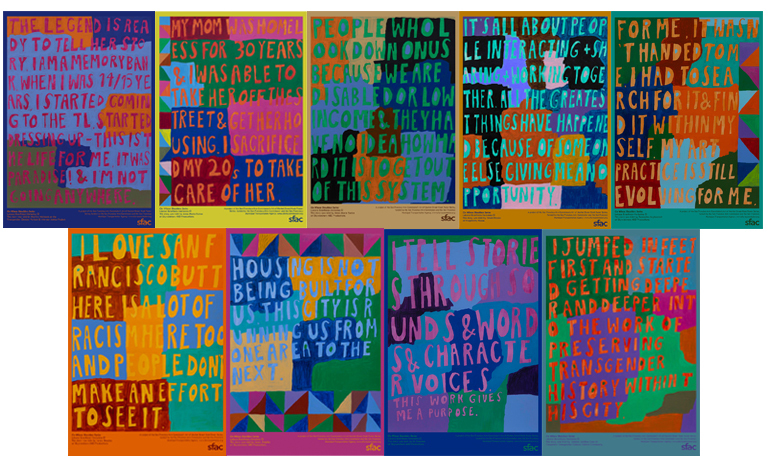 In deep collaboration between Lukaza Branfman-Verissimo, six community members and community partners, On Whose Shoulders weave the stories collected into a series of text-based posters that represent the histories of these rapidly fading communities. Special Thanks to Compton’s Transgender Cultural District Community, Skywatchers ABD Productions, Hospitality House and Transgender Variant & Intersex Justice Project.